Anything related to the field of Technology that I write, be it PCMR, Windows, Ubuntu, Android, Website development, my gadgets, you will find all linked here. Occasionally I also write about my general view on how I use technology to my advantage. Feel free to ask me any questions in comments. If you have your own site, encrypting is something that should be mandatory. Not only does it makes your site secure against hackers/crackers but also google rank those sites higher who serve their site on https. Here’s how you can secure your wordpress based site using certificate provide by Lets Encrypt. To enable HTTPS on your website, you need to get a certificate (a type of file) from a Certificate Authority (CA). Let’s Encrypt is one such CA. In order to get a certificate for your website’s domain from Let’s Encrypt, you have to demonstrate control over the domain. With Let’s Encrypt, you do this using software that uses the ACME protocol, which typically runs on your web host. If you have shell access (that is if you can connect to your host using PuTTY), you can follow the instructions provided here to install certbot. If I remember correctly I was first introduced to WhatsApp as early as 2012 by one of my IRL friend. It was the thing which was “in” at the time. But it wasn’t that well known. Adoption of WhatsApp spread like wildfire since then, and now in 2018, it’s like everyone who have a smartphone have WhatsApp on their phone. Heck, even the non smartphone, like Symbian have a WhatsApp client now. What started of as a small project in 2009 by Brian Acton and Jan Koum, both former employees of Yahoo, in Mountain View, California, soon grew to be a company worthy to be acquired by the Facebook giant in 2014. The acquisition took just US $19 billion out of Facebook’s pockets, but Zuckerberg knew it was a bargain. The USP of WhatsApp was it’s simplicity and ad free experience. The founders promised that it will remain ad free for eternity but never promised anything about simplicity. After being bought by Facebook, WhatsApp went numerous changes which traded the simplicity to introduce features like Instagram, which was another social network app company acquired by Facebook in 2012 earlier for mere 1 billion (sounds like a steal in comparison to WhatsApp deal now, isn’t it?). Telegram on the other hand was developed by two Russian brothers, Nikolai and Pavel Durov who had previously founded the Russian social network VK, but had to leave the company after it was taken over by the Mail.ru Group (credit: Wikipedia). From it’s initial release in 2012, it have grown to become a great alternative to WhatsApp and currently is struggling to keep it out of grips of influential like big corporations and government scrutiny. When I first stumbled on Telegram in October 2015, I confused it with a copy of the app WhatsApp but digging deeper I realized it offered something to the table which WhatsApp couldn’t especially after it’s acquisition by Zuckerburg. I soon began to love Telegram for what it offered and the convenience it bought with it. In those times I use to be a frequent user of IRC and use a channel to communicate most of my online friends. But Telegram changed that. Now I have almost left IRC for Telegram and use it for a lot more reasons then just communication with online friends. I use it as a pastebin, a medium to transfer files, a way to get updates on cryptocurrency and also to chat secretly, if needed. I have tired to compare both of the social network app on features and technical factors. Mechanism for exchanging messages Store and forward Cloud based (server/client encryption) Messages are stored on server, but highly encrypted. So you can access it even if you lost access to your phone, through a PC. On WhatsApp once a message reaches your phone, you can't fetch it again, in case you change your phone. This could be both good and bad and depends on user preference. Personally I prefer Telegram. Delete a message Can delete within 7 minutes of sending a message. Recipient can see you deleted a message. Can delete within 48 hours. Message will be deleted from both you and your recipient's end. Gives user more control over their message. Win for Telegram. Edit a message Can't edit. Can edit within 48 hours. User can see that you edited. Gives user more control over their message. Win for Telegram. Secret Chat No. Yes. The secret chat uses Client-Client encryption to provide a feature that is very useful. Firstly you can only use secret chat from phone and secondly the messages in the secret chat can be auto deleted after a period of time which we can set. It also uses client-client encryption so nothing is stored on cloud. WhatsApp doesn't allow this feature. As a bonus, in a secret chat, it would notify you if the recipient takes a screenshot of the screen while you are doing a secret chat. File Transfer Mediocre support. There's a limit of just 16 MB on videos. And 100 MB for other kind of files. There's a limit of 1.5 GB and any file can be send. WhatsApp only recently supported sending *any* file (than just media), but its limit of 100 MB makes it less powerful than Telegram. A great win for Telegram. Themes No. Only wallpaper can be changes. Yes. Can be customized a whole lot. There are themes available in market and you can create one too in Telegram. I only use the dark theme, not much customization. Desktop Client Yes. But the desktop client takes more memory than web interface, and also requires the accessibility of WhatsApp on your phone. Yes. Telegram have a proper desktop client, which can work even if your phone isn't connected to internet. It's because messages are stored on cloud. It's a big win for Telegram. Due to dependency of WhatsApp on phone, it pretty much makes it useless to access WhatsApp in case your phone dies or don't have Internet. Big reason for why I prefer Telegram. It lets me continue from phone or web or desktop client, seamlessly. Bot support No. Yes. Telegram have bot support, which means you can do tasks like use the IMDb bot to search for movie titles right from within the app. Open source Partial. Mostly it's under Facebook's control now. Yes. Telegram is open source in the fact that you can go on github and make a fork to create your own Telegram client. Self destruct feature I can use Telegram like a clipboard and also to transfer messages between my phone and PC. It doesn't have stupid social network feature like sharing live updates. Self destruct feature means your account will be auto deleted if you don't access the app for a certain time from a month all the way to a year. While there are numerous things which are great on Telegram, I haven’t even mentioned that most of the security features were first added on Telegram and later came out with WhatsApp. But the most important thing is the commitment of Telegram founders which are making efforts to make it more secure and not to let big corporate giants controlling them, thereby it promises more security and privacy. For me though, the most important thing is feature and convenience and for that Telegram is perfect. No wonder more and more companies are choosing Telegram for it’s ability to connect to masses. In this article I am documenting the exact steps that one needs to host a wordpress based site on a Debian based virtual machine (VM). I choose debian since that’s one of the preferred distro based on it’s stability and smaller footprint on resources compared to Ubuntu. But you may very well choose Ubuntu, only some steps in below documentation would differ. Please note that this is just a documentation of the process I followed to fix my Moto E. This is by no means an accurate or official guide to fix your Moto E. If you do mess up your phone trying to follow this documentation, you can't blame me. This article lists a few ways to analyze the usage space of the hard disk through Terminal. The command ‘du’ is used in terminal which stands for disk usage. But the command alone gives listing of all files along with their size. The above command sorts the list, so that the highest space folder appears in bottom of the list. SUDO added since if you want it to run in root folder, normal command won’t have access to system folders. Above command is not path sensitive, which means you can run it from anywhere and also don’t require sudo. Above script (combination of commands) prints disk usage per user and is not path sensitive. The script uses find and awk (extraction command) to give a list of users along with the space they are consuming in bytes. The above command would list top few directories along with their size, sorted in descending order. With above command you can pin point the folder which is taking up space in little time. Also note that the sometimes you need to go deeper by using the command, sudo su, to view space of files taken up by say, /var directory. Which Instant Messenger is best for me? With all the advances that have happened in the world of Internet, one thing is at the core of it. That is Instant Communication. And from the ages of Internet Chat Relays (IRC) to WhatsApp and everything in between is playing a pivotal role in connecting people from all corners of the globe. 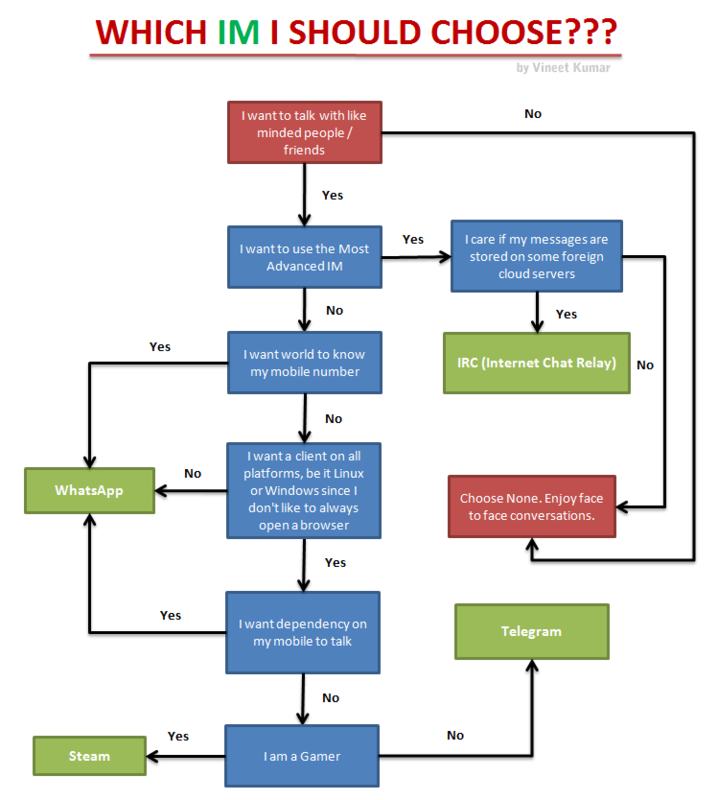 And if you are confused as to what Instant Messenger is right for you, here is a flowchart that lets you decide between few of them. WhatsApp: Everyone uses it since everyone else uses it. But things such as dependency on mobile even if you want to chat on browser makes it a very poorly developed IM. IRC (Internet Chat Relay): It’s the most powerful IM that the netizens have ever used. You can chat privately, in rooms, on PC, on your phone, use bots, leave offline messages.. really the only limit is your imagination and skills to make more functionality. Steam: Steam being the most popular client for gaming provides a client for both Windows, Linux and Android. So if you are a gamer you would tend to use it much extensively. Telegram: It’s currently the most versatile IM as of now. With features such as true cross platform (you can run it on command line! ), ability to share self expiring secret messages, cloud storage (so that you don’t loose your chat history) and with the introduction of bots, I am in love with this IM. Also the fact that you don’t need to share your mobile number like WhatsApp makes it perfect for privacy conscious users. So which IM you use the most and what would be your choice, if you don’t have to come under peer pressure to choose more popular Instant Messenger? I use to have a hard time configuring a new site under a common VPS. So I decided to document the steps for easy reference in future. 1. Buy the domain. Call it site-name.com. 2. Set the nameserver of the domain to point to the IP address of your VPS under ‘A’ record which stands for ‘Address’. For reference, there are other kinds of record like ‘CNAME’ and ‘MX’, but you don’t need to set them at this point. 3. Create a new user on VPS by command by following command. This command also creates a new home directory for the user. What’s a guitarist without his guitar? What’s a painter without his colours? What’s a sailor without a boat? What’s an IT professional without a desktop PC? Answer is common, “nothing much!”. Hence when one of my friend finally decided to get a PC assembled I was very happy for him. I thought to help him out before other priorities gets hold of him and he changes his mind. Before, he use to work either on his age old Celeron laptop or on my computer. He use to play games and watch movies on weekends with me. But now that he finally decided to get his own PC, I had a reason to get my geeky hands dirty in assembling a new PC. There’s some kind of charm in shopping for PC components and then putting them together in one coherent piece so that we can then appreciate the modern advancement, human beings now take for granted. As can be noticed, some of the components had two or more choices in them, arranged by priority. After spending considerable amount of time in researching the prices (in offline and online markets) we finally decided to go to “Nehru Place” to see if we can get good deals in the biggest computer hardware market of Asia. 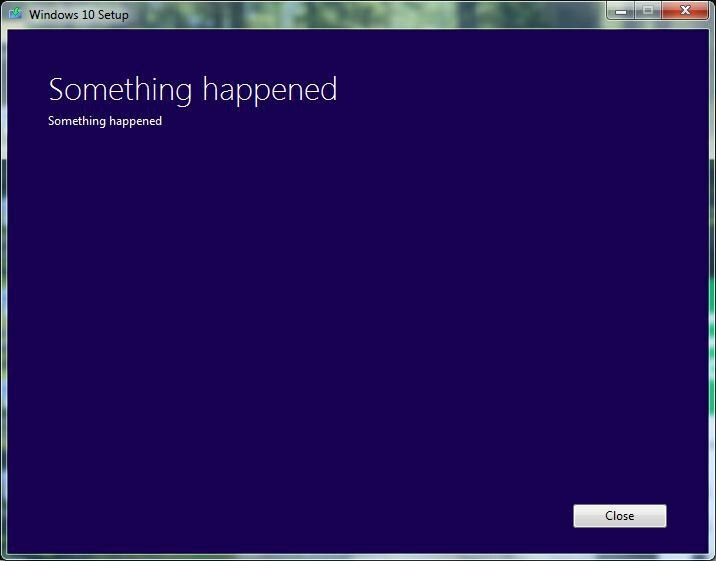 Its been a few days that Windows 10 started rolling out to general public. Even people who never saw past XP seemed to be excited about the new Windows 10. Windows 8 wasn’t a soaring success even for the fans of Windows. Though its predecessor Windows 7 was a leap ahead from the good old XP, the tile interfaced Win 8 proved to be too much of a change. Start Menu had disappeared. It took the users by storm and Windows 8 was rejected by almost everyone, including myself. That’s why Windows 10 is so important for Microsoft. And maybe that’s why Microsoft decided to roll out a free upgrade for anyone who have a genuine license of Win 7 or Win 8.1. Now people, all over the Internet are exploding with enough queries and concerns to overwhelm Microsoft. People are perplexed, furious and amazed with their own experience of upgrading. While everyone is jumping into the bandwagon of the latest operating system, failed downloads and bugs are putting many users off. It all began on 29th July 2015. People who had registered for the update got a prompt that Windows 10 is now available and that they can install it after Windows finishes downloading the update files. I got a prompt too and I allowed the update to download. I got the opportunity to get my hands on a new YU Yuphoria phone last week. Following are my observations and review first hand. YU Yuphoria released in the May 2015 as a successor to the phone Yu Yureka which was released in Jan 2015 by Micromax. YU Yureka was the first phone released under the YU tag. At the price point of Rs 8,999, Yureka provided many features to be found in only high end phones. Yuphoria, released after a few months is kind of a down scaled version of the Yureka but have its own strengths to boast on. As a owner of Moto X (1st gen), the specs of Yuphoria baffled me initially. Yuphoria had similar specs as that of Moto X 1s gen but cost only Rs 6,999. That’s 3.5 times less price than that of Moto X 1st gen with similar features. Lets see the specs at a glance. Yuphoria is a 4G phone with 5 inch screen size, have a layer of Gorilla glass 3 and sports a pixel density of 294 ppi with its 720p resolution. It’s powered with Snapdragon 410, Quad-core 1.2 GHz Cortex-A53 chipset which contains graphics capability of Adreno 306. Snapdragon is Qualcomm’s first 64 bit SOC. In terms of storage it comes with an internal memory of 16 GB (of course less for actual use) but is expandable to 32 GB. The phone contains 2 gigs of RAM enough to never let you go out of memory when playing high end games (for a couple of years at least).